by David Greenberg & Kate Dunlay. 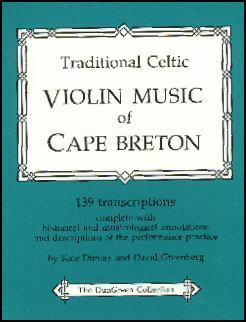 Detailed transcriptions of tunes performed by recognized greats of Cape Breton fiddling. Includes details seldom seen in books of fiddle music (bow pressure, intelligent discussion of how modes affect harmony, a discography & history for every tune, a listing & explanation of ornament symbols and a truly informative introduction ... a must read for anyone new to Cape Breton music. Most of tunes are old chestnuts which have been recorded dozens of times since the 78 era.